Chinese Laundry at ChineseLaundry.com has been at the forefront of women’s fashion footwear since 1981. With several designer lines including Chinese Laundry, Dirty Laundry, CL By Laundry, CL Wash, and Little Laundry, the Chinese Laundry brand has become a top name in shoes for women and girls. Whether you prefer heels, flats, boots or sandals, Chinese Laundry has your feet covered. They even offer a distinct line of vegan shoes for the eco-friendly consumer. Find your next favorite pair at ChineseLaundry.com. Visit RetailSteal.com for all the latest and greatest Chinese Laundry coupon codes, Chinese Laundry discounts, and Chinese Laundry promos. Chinese Laundry offers shipping to the 50 states and Puerto Rico. Contact merchant for international shipments. Allow 3 business days for item to ship from warehouse. If you are unhappy with your purchase, return unworn items within 30 days of receipt. Check site for full details -- exclusions may apply. Use this code online at ChineseLaundry.com and enjoy an extra 30% off already reduced sale items. Enjoy savings of up to 75% off on sale shoes from Chinese Laundry. Shop online at ChineseLaundry.com and enjoy a 15% discount off your entire order. Use coupon code at checkout to save. Save 10% at ChineseLaundry.com with our exclusive RetailSteal coupon code. Exclusions may apply. Shop online at ChineseLaundry.com and enjoy free shipping on all orders. Get ready for Summer with Chinese Laundry and enjoy up to 75% off a wide range of sandals. Enjoy up to 70% savings on a large selection of stylish boots at Chinese Laundry. Click here to shop the selection while savings last. Buy one item and receive the second one for 50% off when using this coupon code at Chinese Laundry. Use this coupon code at Chinese Laundry and save 50% on select clearance items. US orders only! Enjoy 25% savings when using this promo code at Chinese Laundry. Use this promo code at Chinese Laundry and save 15% off tippy top. Enjoy a 50% savings on Chinese Laundry Jinxy with this coupon code. Use this promo code at Chinese Laundry and save 30% off your entire order. Save $20 on your Chinese Laundry purchase when you enter this promotional code on orders of $75 or more. Save $30 on your Chinese Laundry purchase when you enter this promotional code on orders of $100 or more. Save $50 on your Chinese Laundry purchase when you enter this promotional code on orders of $150 or more. Click our link to shop at Chinese Laundry today and enter our coupon code at checkout to save 20% on purchases. 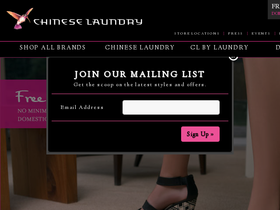 Save 15% on your Chinese Laundry purchase when you sign up for their email newsletter!